Last month, the SKWAWKBOX reported on the fiasco when a legal case against the West Midlands blogger known as the Sandwell Skidder was postponed on its first day in court because the court had lost a letter from the Crown Prosecution Service asking for the blogger, Julian Saunders, to be barred from representing himself when cross-examining Sandwell council’s chief executive. That case concerned an alleged public order offence involving, bizarrely, the use of a single, insulting word said by Saunders to the CEO, Jan Britton. But behind that one questionable charge lies a year-long history of the council’s leader, Steve Eling, pressing West Midlands Police (WMP) to pursuing criminal action against Saunders – not just for a one-word insult but because of the extent to which his blog was discomfiting the council. 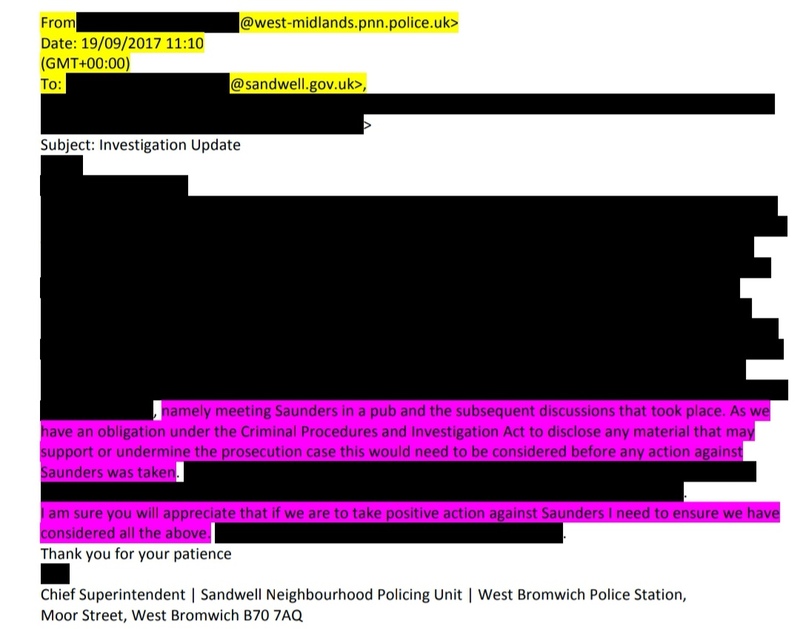 Some of that history has now come to light after Saunders lodged a Subject Access Request (SAR) with WMP under data protection laws, specifically asking for all correspondence it held to or from the council leader concerning Saunders. Saunders has published a long and exhaustive article showcasing the often highly-redacted correspondence released to him in response to the SAR. But while the information is partial and heavy going, it reveals that a WMP Chief Superintendent dismissed Eling’s requests for criminal action – and said he was taking disproportionate police time, funds and resources for a matter that should have gone to civil court if Eling felt he had grounds. 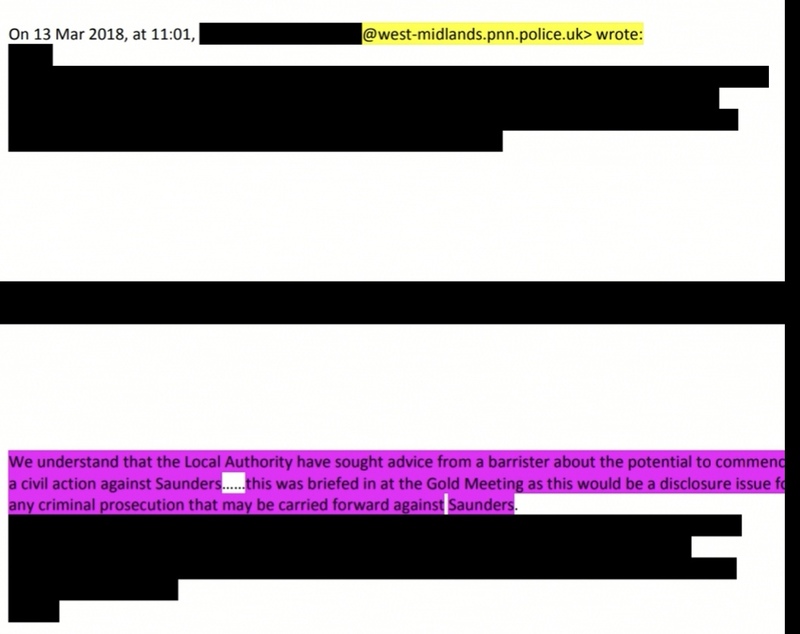 The emails from WMP to Eling even indicate that WMP discussed Saunders at its ‘Gold meeting’ – normally for major or high-level operations. I would strongly advise that if you wish to pursue a legal challenge against Saunders that you consider a civil action… we will not investigate further unless an obvious criminal threshold is met. The SKWAWKBOX invited Steve Eling to comment. He declined to do so “in the current circumstances” – but stated, without explaining what his purpose in doing so was, that he had forwarded this blog’s email to West Midlands Police. “More than proportionate” is surely another way of saying “disproportionate” – and the senior officer’s words “legal challenge” appear to be a recognition that Eling was using police resources to ‘challenge’ Saunders’ claims about him or the council, rather than doing so in a civil action where a court could judge whether Saunders’ claims were false – or indeed true. He’s going to miss being at the centre of his own little universe. I can’t read a word of them emails, I’m afraid. Well played the Chief Super; but in reality even your cadet bobby could’ve told eling that it’s a civil matter…Did the council solicitor not inform eling of this? If not then he should be fired, too. SB – Has David Jamieson the WMP PCC been asked for a comment on this? He was wasting police time and incurred costs unnecessarily. I have never heard from that blogger, but it sounds a bit like abusing the law (police) to censor dissenting views. And we are paying for this….. In a civil case he would have to pay me thinks.